IcedOver wrote: In the new series, Part 5, the credits misspell Amy Shiels name as "Amie". They also misspelled Wendy Robie's name as "Wendie Robie" in Part 12, and Tammie Baird was spelled "Tammy Baird" in Part 6. And it looks like either Cooper's room or the corridor is moving around. In some parts of the corridor the walls have complete wood paneling, other parts of the corridor have half wood paneling and half blue wallpaper. 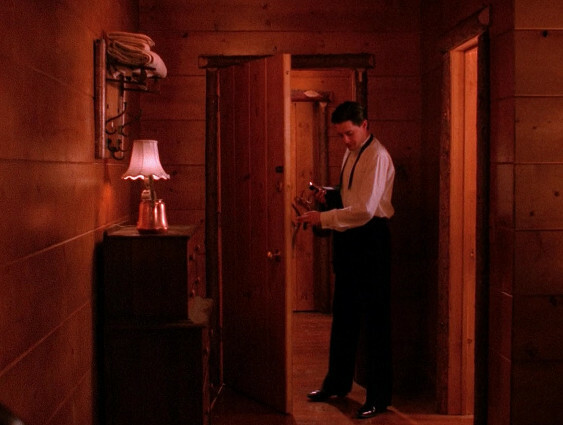 When Cooper was shot in episode 7, there is complete wood paneling on the wall opposite of Cooper's room, but at the beginning of episode 8, when he is lying on the floor, it is half wood paneling and half blue wallpaper. 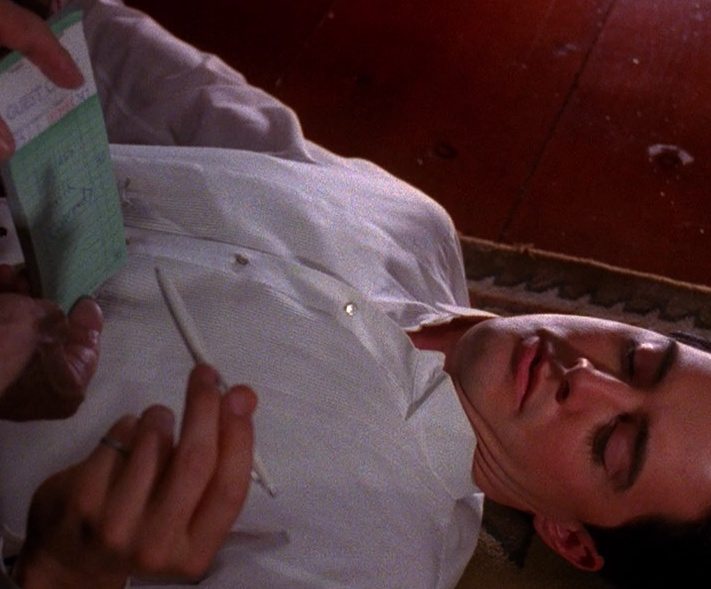 Another goof in this scene: the fish on Cooper's wall is missing in episode 7. 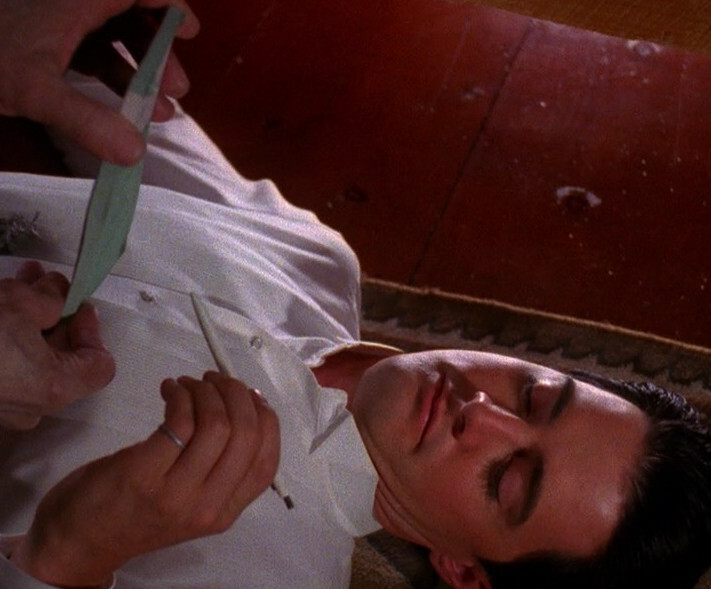 I think at the beginning of episode 8 when Cooper is signing the waiter's bill with a retractable pen, the tip is retracted. At first there is a shot in which you can see the pen's tip (picture 1), but after the cut you can't see the tip (picture 2) and the pen in picture 3 is too close to the paper, so I don't think the tip is extended. Moreover, after he signed the paper, it looks like there isn't even a signature in the place where he "signed" (picture 4). It looks like they corrected that one, at least in the version of Part 5 on Sky Germany her name is spelled Amy. In Part 13, when Anthony watches Dougie walk into the glass door, there is an editing and continuity mistake when the shot changes from Dougie to Anthony and then back to Dougie. In the left corner of the screen you can see the same guy walk to the door twice and two women in the background are standing closer to the left than before. 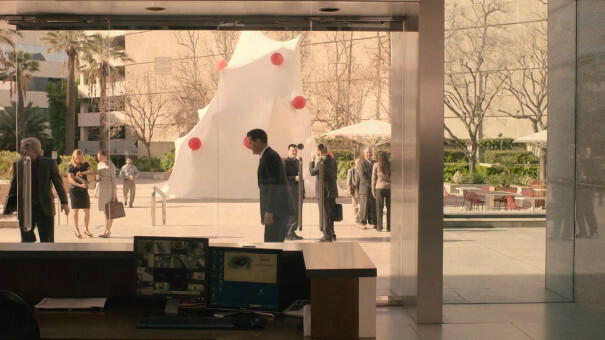 But you know that's a deliberate signal that there's some kind of temporal loop happening, right? Future, past, yadda. In episode 3 of season 1 there is a reversed close shot of Audrey at the funeral. It might have been deliberately reversed because it is followed by a close shot of Cooper looking to the other side and this way it looks like they are smiling at each other, but I always find it distracting that Sherilyn's mole and (parting of the hair) are on the wrong side.